Home >> Generated from JAN's SOAR Information System on 4/21/2019 12:09:12 AM. 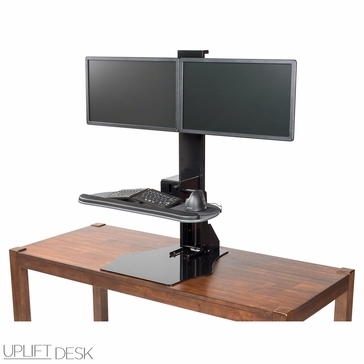 The UPLIFT Adapt Pogo Standing Desk Converter is the answer for those who need a height-adjustable solution without replacing their current desk. It easily works with most desktop surfaces, and transitions pneumatically from a sitting to a standing position with the touch of a button, locking place once the button is released. The generous height range accommodates the majority of users, and the monitor mount fits most dual monitors. Every UPLIFT Adapt Pogo Standing Desk Converter comes standard with a keyboard tray for more ergonomic positioning for typing and mousing.